Cam Buckle, Adjustable Wrist Straps! 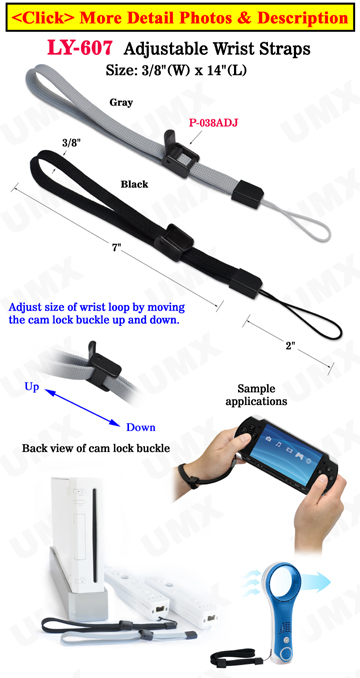 The adjustable wrist straps are great for small devices, tools, cellular phones or cameras. This item comes with an adjustable plastic cam buckle for adjusting the length of straps. Easily slip your wrist into the strap or attach to various items. Any custom printed or custom sized models available. We keep a large inventory in stock available at a low price to wholesalers, distributors or individuals. This item is not only for cellphones. The adjustable wrist lanyards can be used with phone accessories as well. The universal string attached at the end of the strap can be used with your flash players, flash drives, flash medias, USB drives, memory cards, cameras, handheld PDAs, GPS systems, meters and related accessories, etc. Custom Size: Any custom size straps or designs available. Custom Hardware: A variety of custom hardware attachments, buckles or connectors available.